Aquaman is a 2018 American superhero film based on the DC Comics character Aquaman and distributed by Warner Bros. Pictures. It is the sixth installment in the DC Extended Universe (DCEU). It is directed by James Wan, with a screenplay by David Leslie Johnson-McGoldrick and Will Beall, and is based on a story by Geoff Johns, Wan and Beall. It stars Jason Momoa as the title character, with Amber Heard, Willem Dafoe, Patrick Wilson, Dolph Lundgren, Yahya Abdul-Mateen II, and Nicole Kidman in supporting roles. It is the third live-action theatrical film featuring Aquaman, following Batman v Superman: Dawn of Justice (2016) and Justice League (2017), and the first full-length feature film centered around the character. In this film, the titular character learns he is the heir to the underwater kingdom of Atlantis and must step forward to lead his people against his half-brother, Orm, who seeks to unite the seven underwater kingdoms against the surface world. Development of an Aquaman film began in 2004, with several plans falling through over the years. In August 2014, Beall and Kurt Johnstad were hired to write two competing scripts and the film was officially announced in October 2014. Wan signed on as director in April 2015 and in July 2016 it was announced that the film would move forward with Beall's screenplay, although Wan, Johnstad, Johns and Johnson-McGoldrick all performed various rewrites. The main cast was confirmed through 2016 and early 2017. Principal photography began in Australia on May 2, 2017. Most of the film was shot at Village Roadshow Studios on the Gold Coast, Queensland (with lighthouse scenes shot at the New South Wales coastal village of Hastings Point), with production also held in Canada, Italy and Morocco. Filming ended on October 21, 2017. Aquaman had its world premiere in London on November 26, 2018, and was released in the United States in Real D 3D, Dolby Cinema, IMAX and IMAX 3D formats on December 21, 2018. The film grossed over $1.1 billion worldwide, becoming the highest-grossing DCEU film as well as the highest-grossing film based on a DC Comics character, surpassing The Dark Knight Rises; it was also the fifth highest-grossing film of 2018 and 20th highest of all-time. It received praise from critics for its adventurous tone, action, performances, Wan's direction and visual effects but received criticism for its dialogue, runtime and convoluted plot. An untitled sequel is set for release on December 16, 2022 and a spin-off, The Trench, is also in development. In the present, several months after Steppenwolf's invasion,[N 1] Arthur confronts a group of pirates attempting to hijack a Russian Naval Akula-class submarine. Their leader, Jesse Kane, dies during the confrontation while his son, David, vows revenge. Meanwhile, Orm, King of Atlantis and Arthur's half-brother, attempts to convince King Nereus of Xebel to help him unite Atlantis and attack the surface world for harming the oceans. Nereus points out that if Orm succeeds in uniting Atlantis he will receive the title of Ocean Master, commander of the most powerful force on the planet. Their meeting is interrupted when another Russian Akula submarine attacks the meeting place, apparently in retaliation for the previous submarine's sinking. Orm succeeds in destroying it and the attack convinces Nereus to join forces with Orm to defend the oceans. He swears allegiance to Orm's cause, but his daughter Mera, who has been betrothed to Orm, refuses to aid them and journeys to the surface to ask Arthur for help, earning his trust by saving Thomas from a tsunami sent by Orm. Arthur reluctantly accompanies Mera to a rendezvous with Vulko, who urges Arthur to find the Trident of Atlan, a magic artifact that once belonged to Atlantis' first ruler, in order to reclaim his rightful place as king. They are ambushed by Orm's men and Mera and Vulko escape without having been seen, while Arthur is captured. Arthur is chained and presented before Orm, who blames Arthur and the surface for Atlanna's death. He offers Arthur an opportunity to leave forever, but Arthur instead challenges him to a duel in a ring of underwater lava. Orm gains the upper hand and nearly kills Arthur before Mera rescues him. Together, Arthur and Mera journey to the Sahara desert where the trident was forged and unlock a holographic message that leads them to Sicily, Italy, where they retrieve the trident's coordinates. Meanwhile, Orm meets David, revealing that the submarine that had attacked them previously was in fact the same one David hijacked and that Orm had hired him to hijack the Russian nuclear submarine so that he could stage a false flag attack from the surface, making it seem like Orm's cause for war is justified and causing King Nereus to side with him. Orm provides David with a prototype Atlantean battle suit to kill Arthur, imprisons Vulko after revealing knowledge of his betrayal, and coerces the Atlantean Kingdom of the Fishermen to pledge their allegiance to him and his campaign against the surface. 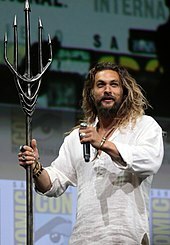 Arthur Curry's Atlantean half-brother and ruler of Atlantis, who seeks to unite the seven underwater kingdoms to declare war on the surface world for humanity's pollution of the seas. ILM was the lead VFX vendor and worked on creating Atlantis and all its CG animals, the Karathen and the final battle of the film. Jeff White served as the VFX supervisor for ILM on Aquaman. For the underwater sequences, the actors were shot dry-for-wet on special tuning fork rigs designed by the FX team and later the bodies of the actors were replaced with digital doubles in post-production. For creating Atlantis the team relied on the designs provided by the art department. ILM's environment team created over 200 buildings, including the signature jellyfish buildings, and laid over 7000 buildings in districts covering almost 600 sq miles for the action to travel through. The underwater ships were modelled off organic creatures and designed to move that way. For the entrance to Atlantis sequence the team built over 150,000 ships to fill the traffic lanes leading into Atlantis. All the animals, including the Karathen, were built by ILM and animated using keyframe animation. David Nelson and Craig Wentworth served as VFX supervisors for Method Studios. Method handled the Sicily fight sequence between Arthur, Mera and Black Manta; Arthur's encounter with the Karathen in the Well of the Souls and his acquisition of Atlan's Trident. For the Sicily fight sequence the team built the main square of the Italian village and terracotta tiled roof set pieces that were backed with blue screen. A completely CG village was also created based on scans and documentation of the real village. For the Well of the Souls sequence Momoa was filmed dry-for-wet and captured on set in rigs that simulated underwater movements, but they ultimately felt restrictive so artists replaced the majority of his performance with a digital body double and added the CG environment, Karathen and Arthur's free-flowing locks. A specially designed 700fps shot was used in the scene where the camera travels through Arthur's eyes. Scanline VFX delivered 450 shots for the movie. Bryan Hirota served as VFX supervisor for scanline. 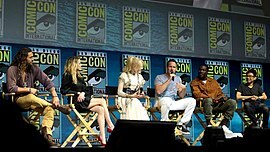 The main sequences produced by them are: the lighthouse and it's surrounding environment, the “Aquaman” title card that follows the Boston aquarium, Aquaman pushing the submarine to the surface and rescuing the sailors inside, Orm's tidal wave that sweeps away Arthur and Tom, including the rescue and aftermath, Black Manta being paid by Orm for the submarine's delivery, and Arthur and Mera's visit to the Kingdom of the Trench. For the creation of the film's title card the team relied on Rodeo's work on the aquarium sequence and simulated up to 60,000 fish. The tidal wave sequence was realized with a large-scale simulated wave, which was integrated with a combination of day for night footage, blue screen shots for the actors in truck interiors, a truck on a rotisserie rig, an interior cabin in a water tank, and VFX simulations for debris. For creating the lighthouse a full-size house with the base of the lighthouse tower was constructed by the FX team. Additional house and dock sets were built on sound stages. A digital build-out was done to complete the lighthouse tower and extend the dock fully out into sea. For the sequence where the camera pushes into a toy snow globe with a tiny lighthouse inside, a CG transition was created from the lighthouse's living room set to a fully CG winter coastline. For creating the Trench creatures, motion capture was done on set by stunt performers. In China, where the film was released two weeks prior to its US debut, the film made $24.6 million (¥169.5 million) on its first day, representing 86% of the market share and setting a Warner Bros. opening day record in the country. It went on to debut to $93.6 million (¥644.8 million), marking the best-ever opening for the DCEU, Warner Bros. and a December release in the country. It also overtook the entire lifetime gross of Wonder Woman there in just three days. The film grossed $12.99 million on Monday, thus crossing $100 million ($107.7 million). By Thursday, its fifth day of release, the film had made $135.3 million, surpassing the lifetime totals of every solo Marvel Cinematic Universe film. As of April 4, 2019[update], the film has grossed $298.33 million in China. In the Philippines, Aquaman is the biggest Warner Bros. and DC film of all-time, with a cumulative gross of Php 536.4-million, surpassing Justice League and becoming the 6th-most successful film of all-time in the country. The film became the highest-grossing film of the decade in Romania. ^ Mendelson, Scott. "Box Office: 'Aquaman' Tops 'Dark Knight Rises' To Become DC Comics' Biggest Movie". Forbes. Retrieved January 29, 2019. ^ Sporn, Natasha (December 3, 2018). "Jason Momoa: Aquaman is the closest I've come to playing myself". Insider. Retrieved April 1, 2019. ^ Knight, Lewis (December 14, 2018). "Aquaman: Nicole Kidman reveals why she took the role of Queen Atlanna". Mirror. Retrieved April 1, 2019. ^ "Why 'Man of Steel' Holds The Key to Warner Bros.' Future Franchises". Quirky Byte. Quirky Byte. Retrieved December 15, 2018. ^ Kroll, Justin (June 3, 2015). "James Wan to Direct 'Aquaman' for Warner Bros". Variety. Retrieved April 1, 2019. ^ Lin, Craig. "Listen To The Epic Music From The Final 'Aquaman' Trailer". DC Films Hub. Retrieved December 22, 2018. ^ a b "AQUAMAN: Kelvin McIlwain – Overall VFX Supervisor". The Art of VFX. January 7, 2019. Retrieved January 10, 2019. ^ "Aquaman VFX Breakdown". January 3, 2019. Retrieved January 10, 2019. ^ "AQUAMAN: Bryan Hirota – VFX Supervisor – Scanline VFX". The Art of VFX. January 8, 2019. Retrieved January 10, 2019. ^ "¿'Annabelle' en 'Aquaman'? | Fandango Argentina". www.fandango.lat (in Spanish). Retrieved December 30, 2018. ^ "Aquaman (2018) - International Box Office Results - Box Office Mojo". www.boxofficemojo.com. Retrieved April 4, 2019.